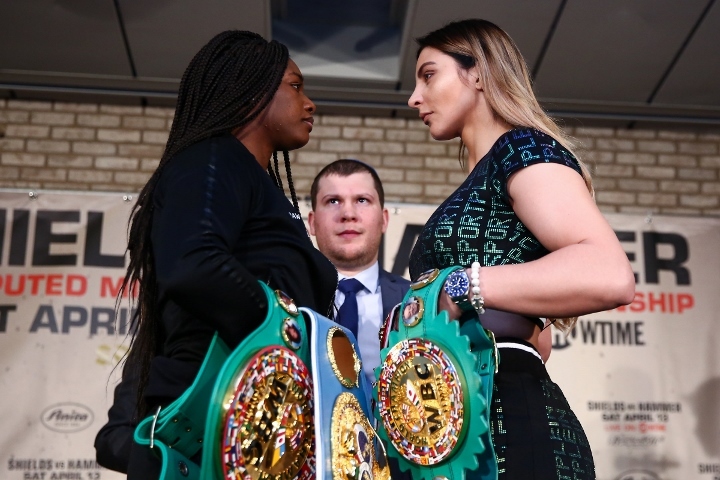 Whatever transpires this weekend, there has been plenty of entertainment value to be found in the buildup to the World middleweight championship showdown between Claressa Shields and Christina Hammer. The pair of unbeaten titlists have not shied away from taking shots at one another—whether on screen or through social media—ahead of their April 13 Showtime headliner in Atlantic City, New Jersey. While not necessarily all in good fun, the trash talk between the two also shouldn’t be mistaken for deep-seated hatred. Shields aims to become just the seventh boxer in history to become undisputed champion in the four-belt era and the quickest to ever accomplish the feat. Already the only American boxer ever to win consecutive Olympic Gold medals, the 24-old from Flint, Mich. has been fighting for titles in the pro ranks since her third pro bout and aims to claim all four belts at 160 pounds just nine fights into her young career. Her opponent has not only been a pro for much longer, but boasts more title fight experience than Shields does overall fights. Hammer (28-0, 11KOs) has held at least one middleweight belt since 2010, a run which is second only to undisputed welterweight champion and pound-for-pound queen Cecilia Braekhus for the longest in the sport, male or female. There is little over that course of time that the 28-year old from Germany hasn’t seen or heard in or out of the ring. If anything, the spirited banter has helped drum up interest for an event being hailed—or at least aggressively marketed—as the most significant bout in the history of women’s boxing. Naturally, things have become testy at times and perhaps even more so as it gets closer to fight night. At no point, however has conversation crossed the line, the same of which cannot be said for several recent or upcoming fights involving their male counterparts.